In the summer the war was always there, but we didn’t see much sign of it. The stories being reported back home about Afghanistan were macabre accounts from Kandahar to the south and Khost further to the east. In Kabul it was warm and pleasant. Hides hung outside the shops, and there was always the smell of raw meat and baked naan. Sometimes the troops moved through the streets, and with the cars and the mule carts, they stirred the dust so that a thin layer settled on the city. But on a day in late August, in the dim hours of the morning as I lay beneath my mosquito net, I woke to a phone call about news of a rocket attack in the city. The presidential election was only a few days away, and no one knew what to expect, though people feared that there would be riots like after the previous election. The electricity was out, and instead of turning on the generator, I dressed, crossed the street to buy mangoes, and returned and sat in my rose garden to eat breakfast. I was scheduled for an interview with another staff member of the National Museum of Afghanistan in an hour, but the phone networks were down and I wasn’t able to reach the number for a secure taxi service. I redialed and heard ringing as two military helicopters flew overhead. My two dogs warned them to stay away. This area marked the brutal front line during the 1992–96 phase of the Afghanistan civil war, but signs still survive of its former glory. An hour later, under a clear blue sky, my taxi drove down Darulaman Road, the long and wide stretch of open road leading to the National Museum. When the British travel writer Robert Byron visited Kabul in the 1930s, he described the poplar-lined strip as “one of the most beautiful avenues in the world.” This area, about nine kilometers southwest of the capital, marked the brutal front line during the 1992–96 phase of the Afghanistan civil war, but signs still survive of its former glory. The dirt road leads to the skeleton of Darulaman Palace, a neoclassical design from the 1920s that sustained repeated rocket fire during the civil war. The palace, which looks north toward the mountain range surrounding Kabul, catches the morning sun. Across the road from the Darulaman Palace sits the museum, and the guards grinned as they saw the car pull up. I owed them photos of themselves posing with their AK-47s. The desk clerk also smiled and greeted me with “Salaam, Joanie jan,” a sign of respect I returned in kind as I continued up the marble stairs inside the main entrance. It was apparent that there was much he was not comfortable saying. The interview was held in a small office with a single window, and it was evident from the papers scattered on the staff member’s desk that it was work as usual at the museum despite the earlier attack. An attendant brought cups of tea, and as she poured I smoothed my hair beneath my silk scarf. I began the interview as I did with all the members of the museum. I explained that my work was to record the museum’s recent history for my master’s dissertation with the University of Edinburgh and a publication with the Aga Khan Trust for Culture. Deep wrinkles creased the staff member’s forehead as he spoke about the museum-wide concern about security and the possibility that the political groups who were involved in the destruction of the museum and its priceless collections, which had dated back thousands of years, could one day return to power. But mostly we talked about the past. For the next three hours in the dark office, the staff member recounted the days when the museum was rocketed daily, antiquities were looted by various mujahideen groups, and the museum staff was incapable of coming to work. 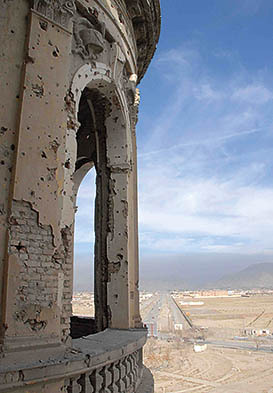 After the Taliban came to power in 1996, he and other staff members were permitted to catalogue the remaining collection and to make repairs to the museum. But then, in 2001, the extremist strand of the Taliban began to target the country’s pre-Islamic statues, such as the Buddhas of Bamiyan, which were dynamited in 2001. At the museum, the Taliban destroyed pre-Islamic statues that had survived previous looting and destruction. Toward the end of the interview, he leaned forward and talked into the Dictaphone about protecting the collections from the Taliban, though it was apparent that there was much he was not comfortable saying. During the 1990s phase of the civil war, many priceless artifacts were either smuggled into Pakistan or wound up in the local bazaars, and after the interview at the museum I decided to head to one such market. Along the drive I looked out my window at the small rolling hills that subdivide the valley city of Kabul. As families have returned after the Taliban, tightly clustered homes have been built further up these hillsides. I wondered whether I would be prepared to say goodbye to the city when my work was finished. Just beneath one of these modern hillside settlements is Babur’s Garden, a public garden where Afghans and expats picnic on the weekends and where the 16th-century Emperor Babur is entombed. In his memoir, the Baburnama, the emperor wrote that he admired the location for its scenery, gardens, orchards, and semi-arid climate. “Within a day’s ride it is possible to reach a place where snow never falls,” he wrote. “But within two hours one can go where the snows never melt.” I looked out at Babur’s Garden and wondered whether I would be prepared to say goodbye to the city when my work was finished. The taxi dropped me off near the intersection at Chicken Street, and a swarm of little boys and girls greeted me with wide smiles and open hands. The street was crowded with hungry children, men laughing and holding hands, women in flowing burqas, and amputees leaning against buildings. As I wandered down the market, the windows brimmed with very old and very beautiful objects: carpets, woodwork, large lumps of lapis lazuli, Turkoman jewelry, and coins that looked strikingly similar to the ones that were looted from archaeological sites and museums. “Where are you from?” an Afghan in his 20s called out from a doorway. “Inglestan?” “No,” I replied, “America.” “Good, United States,” he said in broken English with a smile. I agreed, relieved by his response. His shop was filled with embroidered scarves, and we haggled over two until I was satisfied I was not being entirely cheated. He looked pleased, and we said our goodbyes. Outside the shop a gang of green-eyed boys offered their services as “bodyguards” for a fee. The smell of fresh naan drifted from nearby, and with a couple of these unpaid lads in tow, I made my way on foot to one of the local cafés. The café was quiet, though there were days when you entered and recognized everyone in the crowded room — Kabul is home to a small and close community of devoted NGO workers and journalists. When the waiter arrived he asked whether I wanted my usual cappuccino and apple pie. At the next table a French couple talked about the attack from that morning. They predicted that things were changing for the worse in Kabul, and life there would not be the same. After they left and the air began to cool, I penned a letter that I would later e-mail to my family. As with all my writing now, even this informal prose was written carefully. Working in a war zone, you quickly learn to protect your thoughts and ideas, and to let nothing circulate that is not your own. This vigilance is particularly owed to the Afghans, who have endured hardships for 30 years, and this vigilance is particularly essential when the subject is often the Taliban. In the letter, I told my family about a trip I took the previous weekend to Istalif — a village an hour north of the city — and the river, the mulberry trees, and the pottery. I told them about the walk along the city walls and the views from there of the lake and Babur’s Garden. I explained the history of the museum and the rare antiquities that it once housed, including the Bactrian Gold, a treasure hoard that was successfully hidden from looters during the civil war in the 1990s. If my family only reads about rocket attacks, it would be like admiring a shattered statue by gazing at its broken pieces. I wanted them to also know the stories about Afghanistan from the days when there was no news to report. Joanie Meharry ’07 majored in political science at Bates. She is now in the United States completing her master’s dissertation, after which she will return to work in Kabul. 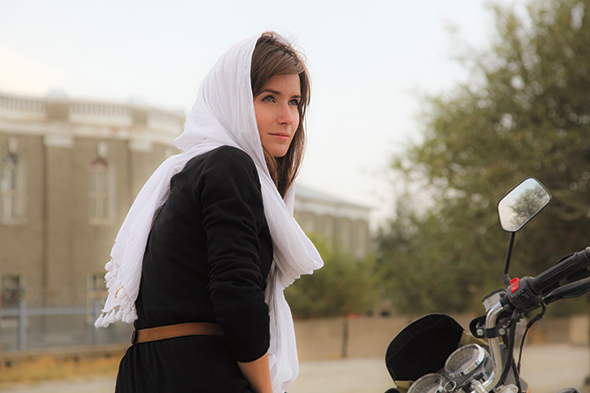 She recommends this video blog about life in Kabul.